★This is a 1/35 scale plastic model assembly kit. Length: 241mm, Width: 84mm. 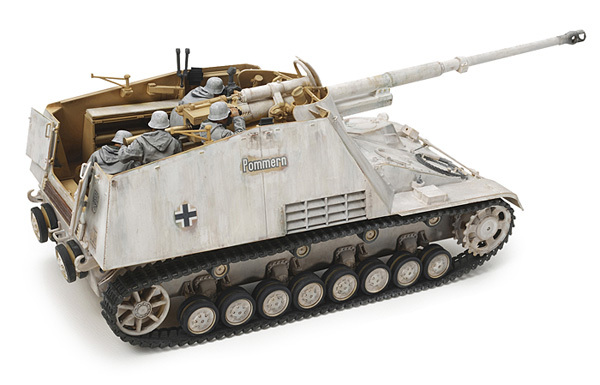 ★Extensive research and study of actual vehicles led to this accurate recreation of the imposing form of the Nashorn with long 8.8cm main gun. ★Features of post-May 1943 vehicles such as late production gun travel lock, muffler-less exhaust pipes and more are faithfully depicted. ★Metal parts are used to allow realistic elevation and depression of the main gun. ★Belt-type tracks. 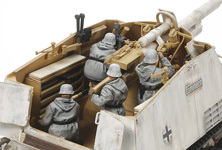 ★4 figures in winter uniform are included, and can be placed in the large fighting compartment to add a further air of authenticity to the model. 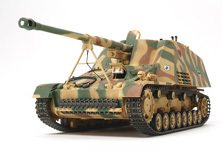 ★Comes with 3 marking options, including Eastern Front vehicle markings. 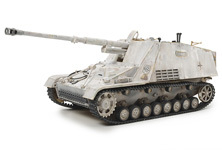 ★The Nashorn is accurately recreated, including the long main gun and large fighting compartment. Moving gun features realistic elevation/depression and traverse. 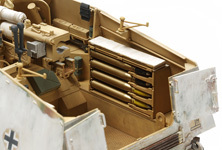 ★The model doesn't ignore the details in the complex fighting compartment, its intuitive use of parts giving a realistic finish. ★The kit includes 3 marking options, with the choice of depicting an Eastern Front vehicle, and even a 3-color camouflage option. 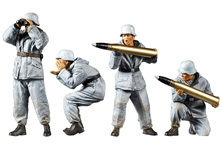 ★Shell racks can be depicted in an open or closed state, and the kit includes parts recreating armor-piercing and high-explosive rounds, in addition to empty casings. 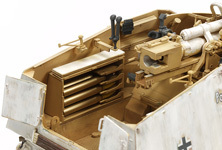 ★The unique breech block featured on the Nashorn is recreated as moving parts. ★4 figures in action pose are included, and depicted in winter gear.